For three years I lived in Manila, Philippines. Not far from my home was an orphanage for children who were deaf and dumb. Frequently, these children were seen at different entertainments that were about the city. One evening I went to attend a lecture in the Y.M.C.A. Right in front of me sat three children. They were very quiet and orderly. When the lecture began the boy who sat in the middle began to make his fingers go as fast as he could. The two children on either side watched him intently. That center boy could hear, the other two were deaf. So he heard the lecture for them and told it to them by the finger language. One day a girl, coming out from school, got on a street car to go to her home. The car was crowded. She found a seat next to a woman who was heavily laden with bundles. She did all she could to hold those bundles in her lap and keep them from falling and scattering their contents on the floor. Then the string of one of the packages became untied. She struggled to get that string fastened securely. She had so many packages, her fingers were numb with cold, and again and again the string slipped just at the crucial time. Finally this school girl, who was an attractive, well-dressed girl, reached over and placed her nicely gloved finger on the obstreperous knot. There was a grateful smile from the troubled woman and a hearty "Thank you." The next stop was the girl's home. As she went to the end of the car she passed a school friend who had watched the little incident. She said to her, "I see you belong to the helping hand society." "No," replied the girl, "not the helping hand, just the helping finger society." This is a great society, girls and boys. Admission to it requires no initiation fee, no dues, simply the desire and the will to be helpful wherever you are. 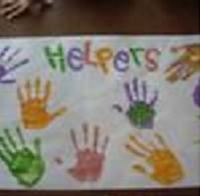 Reflection: Kids can use their hands and fingers to help others. In what ways can they use their hands and fingers to help at home? in school? in church? in the community? God is happy when they use their hands and fingers to help others. 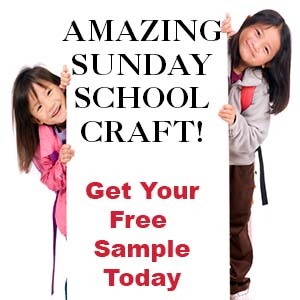 This is a group craft. We will need paint (different colors), cartolina or big sheet of paper, color pens or colored paper and scissor, and disposable plastic plates. Pour some paint onto the plastic plate. One plate for each color. Let the kids dip their hands and make a print on the paper. Then write "Helpers" using the color pens or cut out letters from the colored paper. Alternatively, the kids can trace their hands and color it each a different color.